The most powerful Android phone ever - but is it the best? 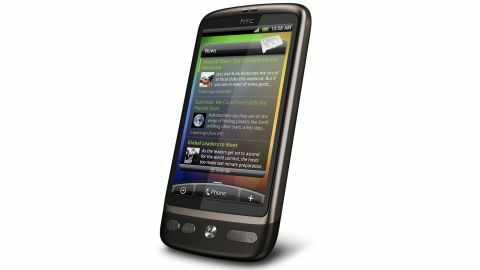 Update: read our Desire HD and HTC Desire S full reviews to see if the older version still stacks up. After unleashing the massively impressive HTC Legend, its bigger brother, the HTC Desire, is here - faster, bigger and more powerful and still packing the Android punch. While the Legend was all about style and functionality in one tidy package - the HTC Desire takes a slightly different approach. Instead of the gorgeous aluminium chassis, we're given a slightly more low-key brown case and a huge 3.7-inch OLED capacitive touchscreen. But while the screen certainly is massive, the phone itself doesn't seem gargantuan. The screen reaches the edge of the chassis nicely, and the four buttons on the front of the HTC Desire are almost flush and set in attractive aluminium. If you're looking for comparisons between this and the Nexus One, the first is highly obvious: the trackball is gone. HTC has given the phone the Terminator eye once more (head back to the HTC Legend review if you want to know why we're glad it doesn't glow red and threaten humanity) which is basically an optical trackpad that registers finger motion over the sensor. The phone is very slim indeed, with dimensions of 119 x 60 x 11.9 mm, and weighs in at just 133g. If you're counting, that's 2g heavier than the iPhone 3G and the exact same weight as the iPhone 3GS - and that makes it very pocket friendly indeed. It has a rubberised chassis, which is a little hard to grip at times. We're not talking so slippy you'll be dropping it all the time, but it still can be a little difficult to hold in one hand, especially if you have dinky digits. There's actually very little button-wise on the HTC Desire, with only six in all. The front four buttons are standard HTC Android fare (Home, Menu, Back and Search) and the Terminator optical trackpad also clicks in as an enter key. The up/down button on the left-hand side of the phone is flush to the chassis, as is the power button on the top - which sits next to the 3.5mm headphone jack atop the HTC Desire. The power button also functions as the lock key, and is very nicely placed to press whenever necessary (and trust us, we've seen some horrors; we're looking at you, Samsung Galaxy). That's it button-wise, as there's no camera key (instead the HTC Desire uses the trackpad to take a snap or two) which is a little sad - we still love a dedicated shutter button. The USB slot is hidden at the bottom - no cover to keep the dust out, but on the plus side it's once again microUSB, banishing the memory of the horrid miniUSB port from HTC designs of old. There's also a microSD card slot for extra memory - but that's hidden below the battery, and can't be taken out without turning off the phone. The screen is simply to die for - we mentioned it was an OLED capacitive effort earlier, but that brings such glorious colour reproduction and 3.7-inch is a great size for media and the internet on a phone. It's a little tacky under the touch - the iPhone for instance feels a little smoother - but we're being very, very picky with that, as it registers the slightest touch with ease. The design is sleek, and the Desire certainly looks the business - sleek and compact, while still showing off the power of the OLED screen. Yes, it lacks the style of the HTC Legend, but we think it more than makes up for that in function. HTC hasn't seen fit to update these, but they're functional and work well to use for calls and media, providing you don't have the same odd-shaped ears as us. There's not a lot more, but with the minimal space in packaging you can see why HTC has kept the components down. We would like to see some PC software on a CD or memory card, but it can be downloaded from the site with ease.